Nathan Brown says he owes the Sydney Roosters a debt of gratitude for the recruits behind his rebuilding project at the Newcastle Knights. In another not so different rugby league world, Kalyn Ponga could well have been lining up for the Roosters on Sunday against Newcastle. When Ponga was chased by the AFL, rugby union and several NRL outfits as a Townsville teenager of rare talent in 2014, the Roosters weren't just in the queue alongside the Brisbane Broncos, South Sydney Rabbitohs and the Queensland Reds. They were front and centre, until the North Queensland Cowboys came to the party with their new recruitment manager Clint Zammit, whose long association with the Ponga family kept the kid up north for a few more years. Now Mitchell Pearce headlines Sunday's mouth-watering Roosters reunion against the man who replaced hm, Cooper Cronk, with Aidan Guerra, Shaun Kenny-Dowall and Connor Watson also taking on the Tricolours after a combined 654 games at the club. "We probably owe the Roosters a bit as a club because the four players we got out of there are great guys, great trainers and good competitors," Brown told NRL.com. "Credit goes to Robbo (coach Trent Robinson), Fitzy (assistant Craig Fitzgibbon) and the coaching staff, when you get players that do that stuff well, naturally they’re coming from a good club aren’t they? "We’ve been very fortunate and probably owe the Roosters a little bit because they’re coming into the prime of their career." Ponga on the other hand, is still only 19, with it all before him and everyone watching. Which is exactly where Pearce was a decade ago, making his NSW debut at the same age. The proverbial has dismantled the fan every time he's worn the sky blue since, while Pearce has also weathered pretty much every other storm the game can muster, including a few created all on his own. Ponga has only 11 Telstra Premiership games under his belt, but a multimillion-dollar deal to his name. Pearce has more than a few wrong turns on his ledger, but there are worse places Ponga can turn to when it comes to keeping a cool head among the hype. "Kalyn has said a couple of times, they've got a very good relationship away from footy, off the field and then on the field as well," Ponga's manager Wayde Rushton said. "For Kalyn, I think when someone like Pearcey asks his opinion and his take on something, he really appreciates and respects that, that his feedback is important. "I think Pearcey going there has been a bit of a blessing for Kalyn too, because there's always pressure if you're the highest paid or highest profile (player). And for a kid of 19, he's got enough pressure. "Away from footy his life is family, he's very focused on that and then his footy is just footy for him." When Ponga moved from Townsville to Newcastle, his family went with him. The Ponga clan are describing that sea change as the best they've made. 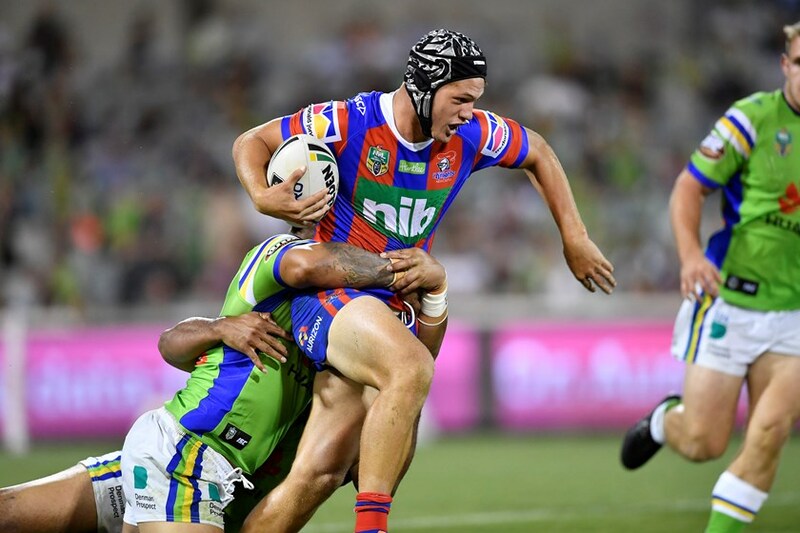 Along with a No.1 jersey he is making his own and a healthy pay packet, life in the Hunter was a key part of the Knights' sales pitch – casting back to those first overtures from the Roosters, when shipping a 15-year-old Ponga to the big smoke was a chief concern. The young custodian has proved instrumental in Newcastle's two tight wins to start 2018, which in turn have the region buzzing about rugby league. "Kalyn’s not doing anything that’s surprising us," Brown said. "The thing he doesn’t get credit for is he’s actually a really good kid. He’s down to earth. He’s confident about what he can do and he’s been brought up very well. "He’s a very polite kid and regardless of all the hype around him, he turns up to training and he wants to get better."